Eat Chinese dishes, learn Chinese! Feel familiar with the language in our way. Have dinner and learn Chinese! Our staff from China answers any of your questions regarding Chinese language. There are Japanese people who have learnt Chinese, and many people from China who would like to interact with Japanese friends. All you can eat (including Peking Duck!) 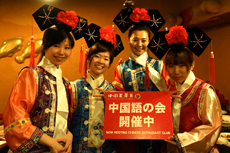 and drink, this is a nice opportunity to hear authentic Chinese in Japan. Don’t worry if you are shy or come to join us alone! Let’s try to place an order, introduce yourself or ask questions about the dishes in Chinese to be confident in your ability. Of course you are welcome to join us with your friend. From beginner to advanced, from teens to people in their 70’s. You are all welcomed! Copyright © Chinese cafe Eight All Rights Reserved.